4 − 2 = Required Please enter the correct value. The Apple stock price slumped 2% following the company's biggest product unveiling of the year today (Wednesday). But in the long run, today's announcements will propel AAPL stock to new heights. Apple Inc. (Nasdaq: AAPL) revealed the new iPhone 6S and iPhone 6S Plus, as well as a larger iPad aimed at the business market and a revamped Apple TV. Wall Street at first seemed impressed by Apple's news. AAPL stock rose as much as 1.5% in the minutes after CEO Tim Cook started speaking. But after that, Apple stock tumbled. By the time the market closed, AAPL had surrendered 1.92%, or $2.16. Apple stock ended the session at $110.15. For the most part, the pre-Apple Event rumors were spot on. However, Cook did provide a mild surprise by unveiling a few new models of the Apple Watch, along with some new watchbands. It never hurts to refresh a product line heading into the holiday shopping season. Apple's marquee product, the iPhone, physically looks almost identical to last year's models. The screen sizes of 4.7-inch and 5.5-inch – last year's game changer – are exactly the same. But Apple made significant upgrades under the hood. The A9 chip that runs the iPhone 6S models is (according to Apple) 70% faster than the A8 chip it replaces. Its graphics module is 90% faster. Apple also upgraded the rear camera to 12 megapixels from 8, and the front camera from an inadequate 1.2 megapixels to 5. The headline feature this year is something Apple calls "3D Touch." It means the glass screen can react to the pressure the users applies. The 3D Touch feature opens up a range of new ways to interact with the iPhone system as well as the apps running on it. The big concern is whether this year's upgrades will be enough to keep iPhone sales humming as they have been for most of the past 12 months. Because the iPhone accounts for about two-thirds of Apple's revenue, that's a key question. 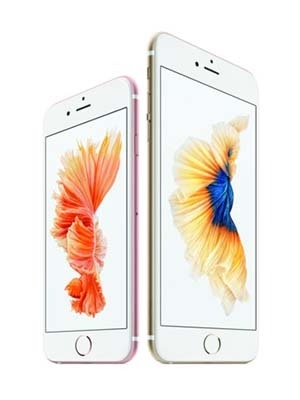 While not as dramatic an upgrade, the iPhone 6S models will sell well enough to keep the Apple profit machine well-fed. One reason is because as of the most recent quarter, only 27% of its customers had upgraded to the iPhone 6. So there's plenty of opportunity there. Don't forget, many U.S. customers on two-year plans are still using an iPhone 5S or iPhone 5C with the puny 4-inch screen. They'll be eager to upgrade.